Ad-spaces are always useful because they let you show ads in a different way rather than simple ads. 125X125 ad-space is even more useful than ordinary ad spaces because it lets you to show 4 ads at a time and all ads could be of different ad networks so you earn from all networks. It also adds a star to your site design so your site looks more professional. Also 125X125 ad-space compress your ads in a small area so if you want you can show 8 ads by just consuming ad space of 2 square ads, hence it is a beneficial thing. 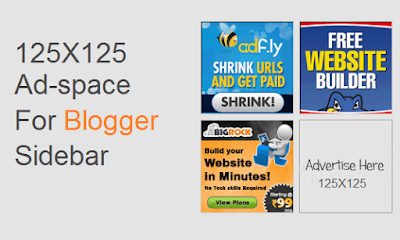 So here is a quick post about how to add 125X125 ad-space in blogger sidebar. I will share two types of ad-spaces one for showing ads of any ad network and one for personal ad campaigns in which you need to add your advertisers ad image url and target url. 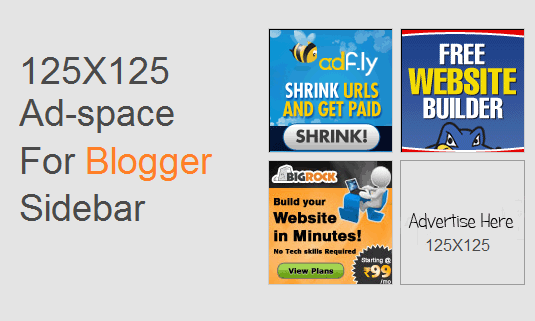 How to add 125X125 Ad-space in blogger sidebar ? Step 1: Go to Blogger Dashboard and open Layout. Step 2: Click on add a gadget in right or left sidebar. Step 4: Copy code of ad space from below by your choice. Step 5: Replace ad code text with your ad codes or add your advertiser's ad's image and link. <li>YOUR 125X125 AD CODE HERE</li> for ad network ads. I hope you found this post helpful, if not leave a comment or contact me. Thanks for visiting 101Helper, Happy Blogging !